The Ashby Education Foundation (AEF) does many things for Ashby School. They support quality education in the Ashby School District by raising, managing, and granting funds. Teachers and community members can apply for grants for educational materials such as technology equipment, art supplies, athletic equipment, science kits, library books, and more. Mr. Jeremy Knick, Ashby first grade teacher, received funding for an IXL math program license, a license for iPads, and kid-friendly iPad cases from the AEF. The IXL math on-line program is a great supplemental standards based math practice program that is used daily by the first and second grade classes. IXL helps the students make gains in the area of math. The iPad cases offer great protection for the iPads that the students also use on a daily basis. 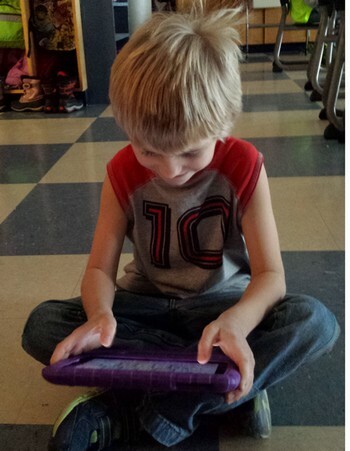 The cases help prolong the life of the iPads. These generous AEF grants have enabled our students to benefit greatly. 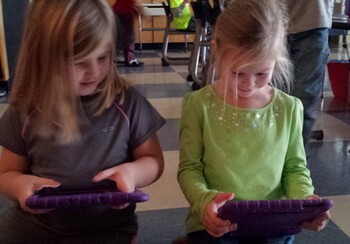 Pictured below, several first graders work on IXL math using their ipads securely protected by the kid-friendly ipad cases. ​Tanya Maethner, AHS English teacher, has applied for AEF grants for books (chapter books and novels) for her classroom library. The books are being used by her English students in grades 9 through 12. She has gotten roughly about 250-275 books total over the last 4 years. Most of them are paperback books. 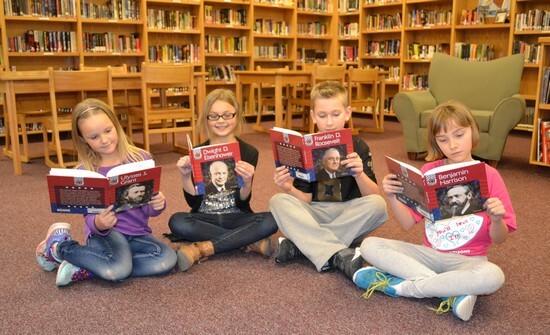 This AEF grant has helped kids become more independent readers with easy access to novels right in the classroom. This huge selection makes it easy for kids to choose their own book to read. It is handy having all those different varieties of books to choose from. Mrs. Maethner does book checks each quarter and in order to get an “A” students need to have read at least 800 pages per quarter. 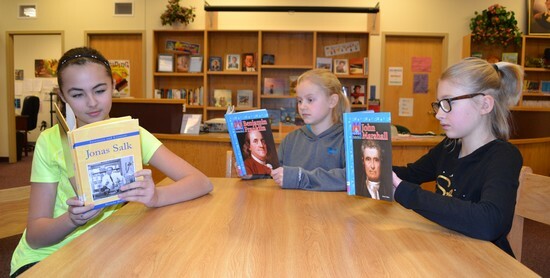 Mrs. Maethner stated, “Students who read a lot are better students overall.” Pictured below, students browse through Mrs. Maethner's extensive classroom library for a book of their interest. Mr. John Kent, AHS Science teacher, received an AEF grant for his Anatomy class to become CPR certified. This is a class which he teaches every other year to juniors and seniors. The grant also gave him stethoscopes, blood pressure machines, and electronic scales. The CPR grant is used for a lifelong certificate that may come in handy in saving a life one day. The AEF grant materials are benefiting our school because hopefully, they will help in a emergency situation in saving someone’s life. The AEF is helping our school by awarding grants for extra things we need in the Science department that we otherwise wouldn’t have. 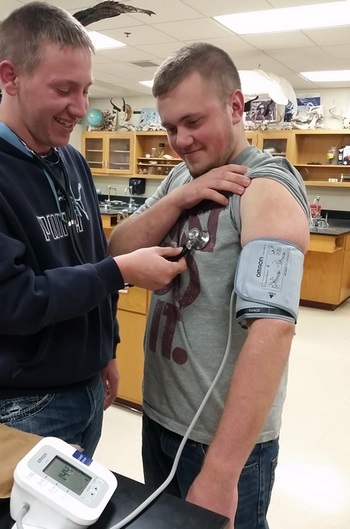 Pictured below several juniors experiment with the blood pressure machine. During the 2013-2014 school year the AEF awarded a grant for art supplies to Ashby art teacher Ms. Camille Schultz. The department received silk stretch canvasses, paint, calligraphy books and tools, ceramic tiles, and glaze. 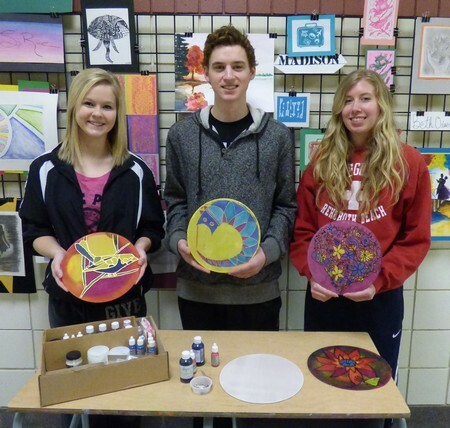 The 11th and 12th grade art class used the silk stretched over a frame and dyes to do silk paintings. This was the students first experience with silk painting and it was a good experience. 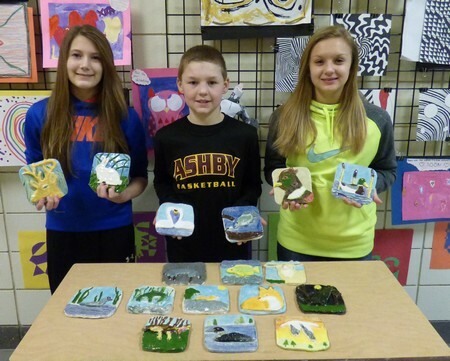 The 6th grade class made clay ceramic tiles with the new glaze. These tiles will be hung permanently on the school walls. Their theme was animals from Grant County. 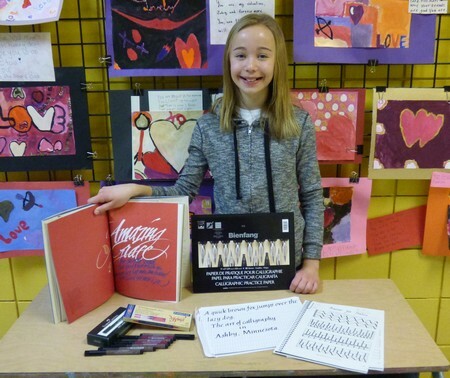 This grant exposed students to different art media. The tile project was a great experience for the sixth graders and their work will be decorating the walls of the school for years to come. This school year, 2014-2015, the AEF awarded the Art Department another grant to purchase clay and more silk stretch canvasses for use in the intermediate and high school art classes. Mr. Perry Butler, computer coordinator, received a grant from the AEF for an interactive projector to be placed in Room 151 where several teachers use the room. They need a projector but not necessarily a Smartboard that costs $1000 more. This will provide an interactive projector in a room where there currently is none.